We're a small business. We like selling cool toys to people. But if you come on our forums and sell stuff, how are we supposed to make a living, huh? Posts offering to sell ANYTHING will be deleted. Repeat offenders will be banned. Links to e-bay auctions are NOT ALLOWED. Derogatory comments about race, ethnic background, language, sexual preference or religion will not be tolerated. Be nice to people. Try to keep your language clean. We're not going to be the thought-police on this one, just use common sense and don't post anything your mom would wash you mouth out for. No bashing or flaming. Keep all trades and trade-talk in the "Trades" forum. Post about trading anywhere else and your post will be moved there. No professional sellers in the trades forum please. And, as the name suggests, trading only...no selling, no linking to your e-bay auction, no "trading for cash." Abusers may or may not get a warning before we ban them, so if you think what you are posting might violate our policies, don't post it. M'kay? Anyone sending spam (defined here: http://www.spamhaus.org/definition.html) to our forum members via Private Message or other means will be banned immediately. If you are unsure if the message you plan to send or post is spam or not, PM me first and ask. That is all. We're hoping that you enjoy visiting our forums and can network with other designer toy enthusiasts and artists easily here. 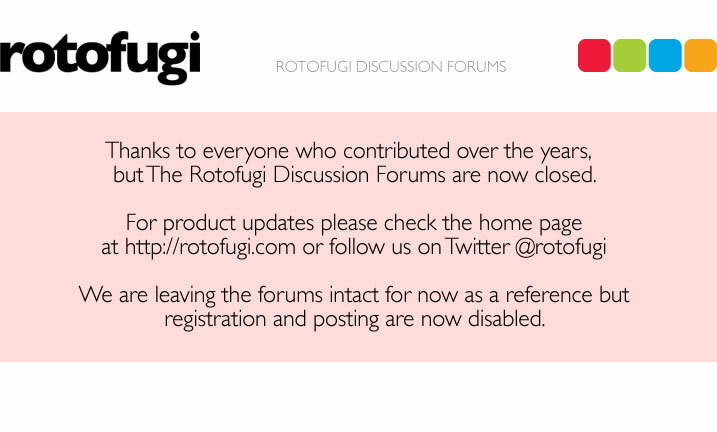 If you have any questions regarding the forums please feel free to PM me or post in the "Ask Rotofugi" forum, I'll get back to you as soon as I can. Last edited by rotokirby on Sun May 29, 2005 7:47 am, edited 1 time in total.